Signature Edits is a training platform for photographers. Learn from the pros & build your photography business. Sign up now for FREE Lightroom Presets, branding resources & training! YES - Give me that awesomeness! 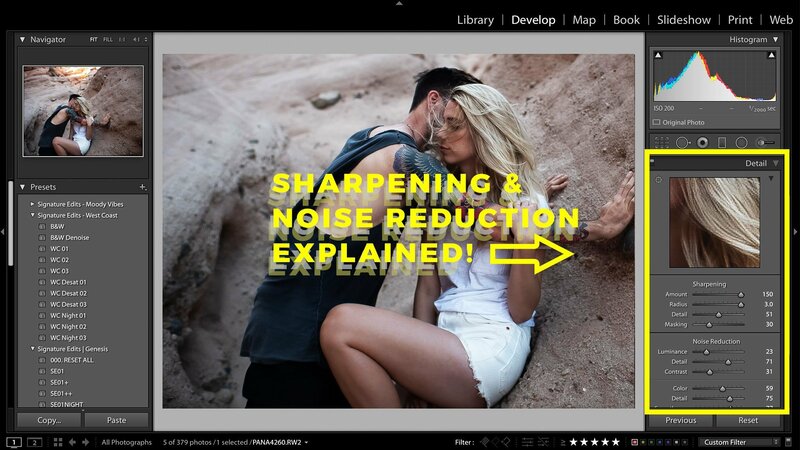 How to properly apply sharpening & noise reduction to your photos! Tired of not really knowing what all the different sliders in the sharpening panel in Lightroom do? Want to know the best settings for sharpening your photos in Lightroom or exporting for Instagram? Learn how to use the sharpening & noise reduction tools inside Adobe Lightroom in this in depth tutorial. Finally understand what the radius, detail, masking & smoothing slider do in Lightroom! The Lightroom sharpening & noise reduction tools aren’t just for beginners – We’re going to explain how to use the detail panel in Lightroom step by step. Learn 3 step sharpening and the best sharpening and noise reduction settings in Lightroom. This tutorial is for Lightroom 7, Lightroom CC, Lightroom CC Classic or Lightroom CC Mobile – The principals will apply to all of them. In this video, we’ll be covering: 1) The detail panel in Lightroom CC Classic (Same tools apply in Lightroom 4,5,6,7 and CC) 2) Every slider in the sharpening section. Amount, Radius, Detail, Masking 3) Every slider in the noise reduction section. Luminance Noise reduction, detail, contrast, colour noise reduction etc. 4) 3 step sharpening in Lightroom – Master sharpen, targeted sharpening, and best sharpening settings for exporting. Everything step by step and in depth so you not only know HOW to apply sharpening to your photos in post production, but WHY to sharpen your photos and what sharpening settings are best. Enjoy, and happy photo editing! Ryan is a photographer, filmmaker and editor, as well as entrepreneur and founder of Signature Edits. He's a creative with a heart for adventure, exploration, and pushing boundaries. Psst... Want Crazy Awesome Free Presets? “The Brenizer Method” Tutorial – Crazy Photo Technique! Photoshop Poster Tutorial: Epic Text Poster! What Is Aperture? Aperture & fstop explained! How To Create A Matte Effect In Lightroom In 10 Seconds! How to price your photography: One crazy trick to double your average sale! Psst… Want Crazy Awesome Free Presets? Free Lightroom Presets, Tutorials & Branding Resources! Explore our free articles and free training, and get started now with our free preset pack! *Danger* You're Going To LOVE This. Want to take your photo game to the next level? Download 45 Epic Lifestyle Presets for FREE. Just our way of saying thanks for visiting. Want epic free presets & training? HECK YES - SIGN ME UP!